The Border Collie is a well balanced, medium-sized dog of athletic appearance, displaying style and agility in equal measure with soundness and strength. Its hard, muscular body conveys the impression of effortless movement and endless endurance. The Border Collie is extremely intelligent, with its keen, alert expression being a very important characteristic of the breed. Any aspect of structure or temperament that would impede the dog’s ability to function as a herding dog should be severely faulted. The Border Collie is, and should remain, a natural and unspoiled true working sheepdog whose conformation is described herein. Honorable scars and broken teeth incurred in the line of duty are acceptable. Expression is intelligent, alert, eager, and full of interest. Eyes are set well apart, of moderate size, oval in shape. The color encompasses the full range of brown eyes, dogs having body colors other than black may have noticeably lighter eye color. Blue eyes (with one, both or part of one or both eyes being blue) in dogs other than merle, are acceptable but not preferred. Eye rims should be fully pigmented, lack thereof considered a fault according to degree. Ears are of medium size, set well apart, one or both carried erect and/or semi-erect (varying from one-quarter to three-quarters of the ear erect). When semi-erect, the tips may fall forward or outward to the side. Ears are sensitive and mobile. Neck is of proportional length to the body, strong and muscular, slightly arched and blending smoothly into the shoulders. Topline – Back is level from behind the withers to the slightly arched, muscular loins, falling to a gently sloping croup. Body is athletic in appearance with a deep, moderately broad chest reaching no further than the point of the elbow. The rib cage is moderately long with well sprung ribs. Loins moderately deep and short, muscular, slightly arched and with a slight but distinct tuck up. Forelegs should be parallel when viewed from front, pasterns slightly sloping when viewed from side. Because sufficient length of leg is crucial for the type of work the breed is required to do, the distance from the wither to the elbow is slightly less than from the elbow to the ground and legs that are too short in proportion to the rest of the body are a serious fault. The shoulder blades are long, well laid back and well-angulated to the upper arm. Shoulder blades and upper arms are equal in length. There is sufficient width between the tops of the shoulder blades to allow for the characteristic crouch when approaching and moving stock. The elbows are neither in nor out. Feet are compact, oval in shape; pads deep and strong, toes moderately arched and close together with strong nails of moderate length. Dewclaws may be removed. Two varieties are permissible, both having close-fitting, dense, weather resistant double coats with the top coat either straight or wavy and coarser in texture than the undercoat which is soft, short and dense. The rough variety is medium in length without being excessive. Forelegs, haunches, chest and underside are feathered and the coat on face, ears, feet, fronts of legs is short and smooth. 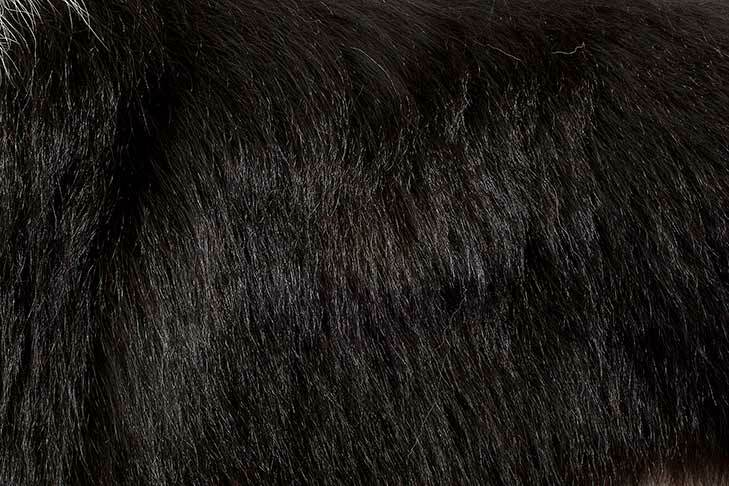 The smooth variety is short over entire body, is usually coarser in texture than the rough variety and may have slight feathering on forelegs, haunches, chest and ruff. Neither coat type is preferred over the other. Seasonal shedding is normal and should not be penalized. The Border Collie’s purpose as an actively working herding dog shall be clearly evident in its presentation. Broad and muscular, in profile sloping gracefully to the low set tail. The thighs are long, broad, deep and muscular. Stifles are well turned with strong hocks that may be either parallel or very slightly turned in. Dewclaws should be removed. Feet, although slightly smaller, are the same as front. 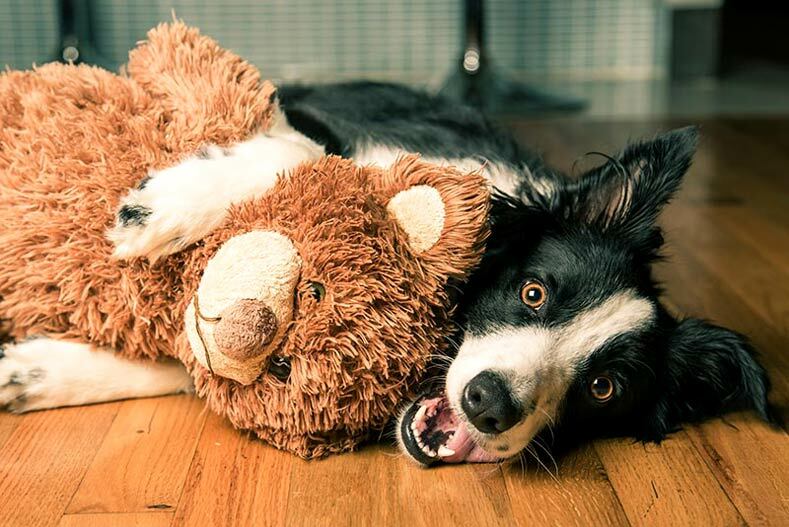 A remarkably bright workaholic, the Border Collie is an amazing dog—maybe a bit too amazing for owners without the time, energy, or means to keep it occupied. These energetic dogs will settle down for cuddle time when the workday is done. Borders are athletic, medium-sized herders standing 18 to 22 inches at the shoulder. The overall look is that of a muscular but nimble worker unspoiled by passing fads. Both the rough coat and the smooth coat come in a variety of colors and patterns. The almond eyes are the focus of an intelligent expression—an intense gaze, the Border’s famous “herding eye”, is a breed hallmark. On the move, Borders are among the canine kingdom’s most agile, balanced, and durable citizens. The intelligence, athleticism, and trainability of Borders have a perfect outlet in agility training. Having a job to perform, like agility—or herding or obedience work—is key to Border happiness. Amiable among friends, they may be reserved with strangers. 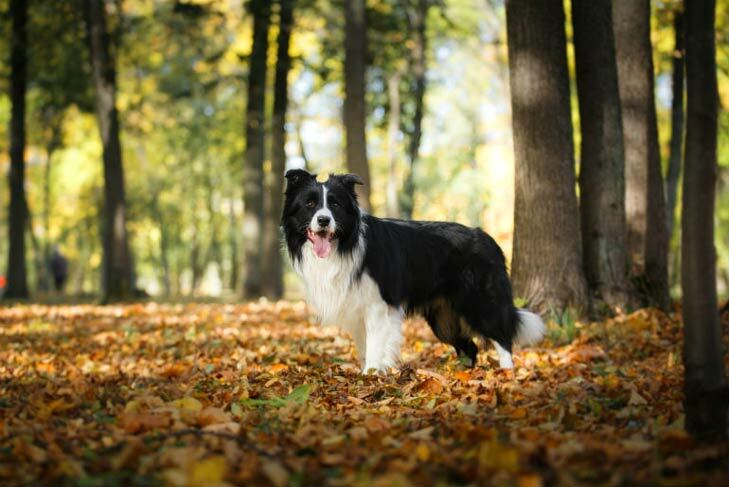 The Border Collie should do well on a high-quality dog food, whether commercially manufactured or home-prepared with your veterinarian’s supervision and approval. Any diet should be appropriate to the dog’s age (puppy, adult, or senior). Some dogs are prone to getting overweight, so watch your dog’s calorie consumption and weight level. Treats can be an important aid in training, but giving too many can cause obesity. Learn about which human foods are safe for dogs, and which are not. Check with your vet if you have any concerns about your dog’s weight or diet. Clean, fresh water should be available at all times. There are two types of coat in the breed. The rough coat is medium-length and feathered, while the smooth coat is shorter and coarser. Both are dense, weather-resistant double coats. Grooming is the same for both: going over the dog with a pin brush once or twice a week, more often if needed, to keep the coat free of mats, tangles, dirt, and debris. During shedding season, daily brushing is required. As with all breeds, the BC’s nails should be trimmed regularly. 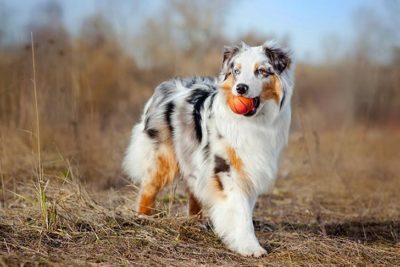 This high-drive, athletic breed is extremely energetic and requires daily exercise beyond just a walk around the block or a quick romp in the yard. They thrive when they have a job to do and space to run. A Border Collie who doesn’t work must be provided with vigorous exercise every day. Clearly, this is a breed for an active owner, and not for someone who prefers to stay indoors or who travels away from home frequently. 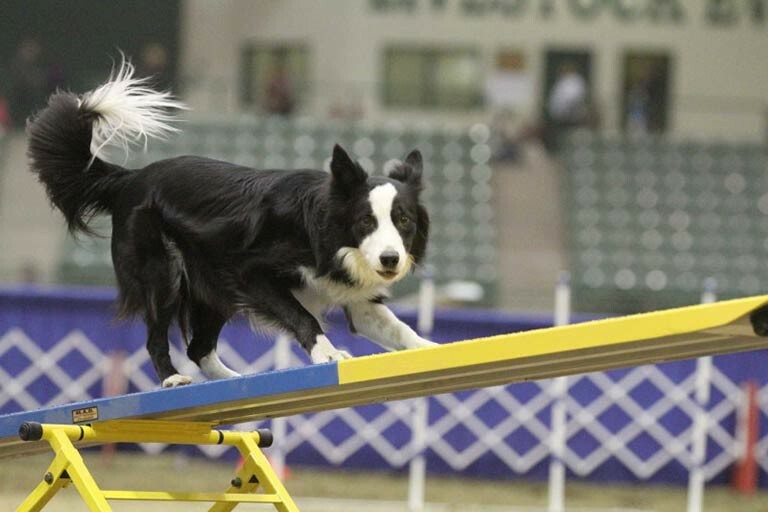 BCs often participate (and excel) in herding events, not to mention obedience, agility, rally, and tracking competitions, and sports such as flying disc and flyball. 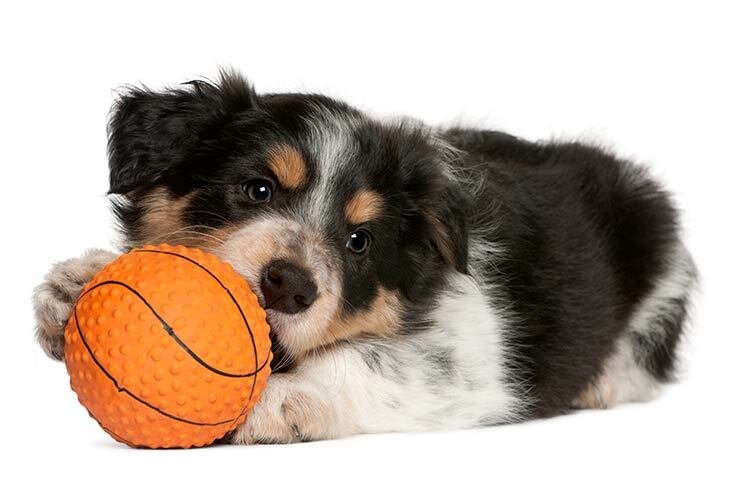 Early socialization is especially vital with the Border Collie, entailing positive exposure to a wide variety of people and situations from early puppyhood through about seven months. Obedience training that starts early and continues throughout the BC’s life will keep him happy and provide needed mental stimulation. 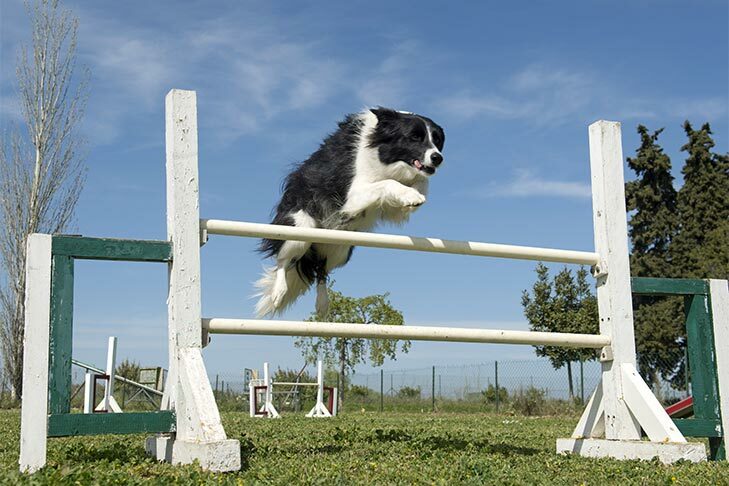 Border Collies are highly intelligent and highly trainable and are superstars at canine activities such as herding, obedience, and agility. Due to their tendency to herd animals and people, they do best with older, well-behaved children. They love their families but may be somewhat reserved with strangers. 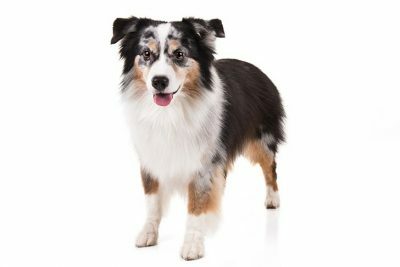 The Border Collie is generally a very hardy and healthy breed, and a responsible breeder will screen breeding stock for health conditions such as hip dysplasia, progressive renal atrophy, deafness, epilepsy, collie eye anomaly, neuronal ceroid lipofuscinosis, and trapped neutrophil syndrome. A BC’s ears should be checked regularly for signs of infection, and the teeth should be brushed regularly. During the glory days of the Roman Empire, successive emperors drew up plans to invade and conquer Britain. But, for various reasons—uprisings in other parts of the empire, or shifting political situations—the plans were shelved. Finally, in the year 43, the emperor Claudius fulfilled this long-held dream of conquest. The Roman occupation of Britain had a great influence on virtually every aspect of British life. This included dog breeding. The occupying legions brought along their own food source, livestock. And where livestock goes, herding dogs are sure to follow. The large, heavy-boned herding dogs imported by the Romans remained a fixture on the British landscape for more than three centuries. During the long, slow dissolution of the Roman Empire, fierce Viking raiders took their turn invading Britain. They, too, brought along their dogs. 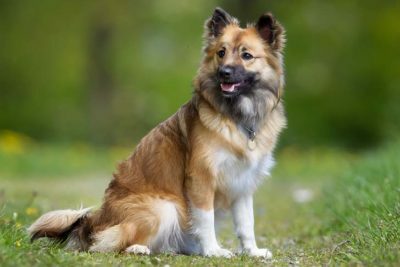 These were smaller, quicker, spitz-type herders, progenitors of such contemporary breeds as the Icelandic Sheepdog. Crosses between the old Roman dogs and the Viking spitzes produced compact and agile herders, well equipped to work stock in the hilly, rocky highlands of Scotland and Wales. Thus began the history of the Border Collie. Borders have been called the world’s greatest herders, and anyone who’s seen them work—with their sweeping outruns, their stealthy crouching and creeping, and their explosive bursts of focused energy—would have to agree. When shepherds dream of the perfect dog, you can bet it’s a Border. As immortalized in the movie “Babe,” Borders have dominated competitive sheepdog trials in the British Isles for more than a hundred years. 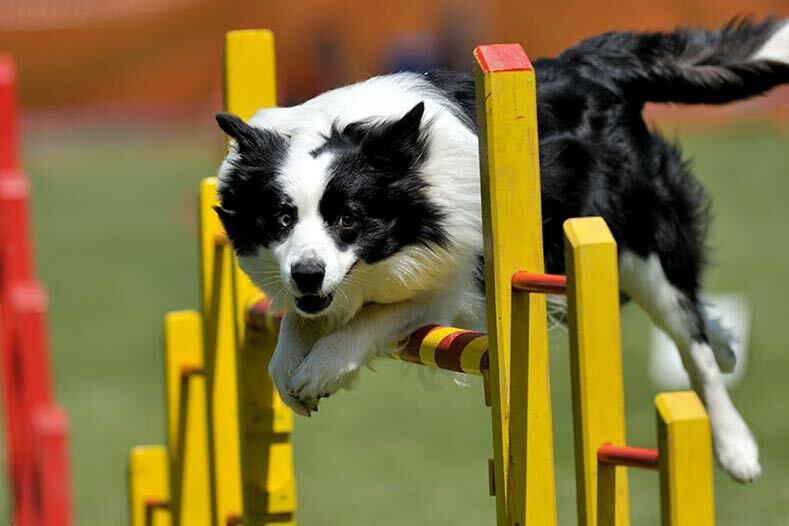 Borders also rule the championship levels of the fast-paced sport of agility, and they routinely top lists of world’s smartest dog breeds. The Border Collie joined the AKC Herding Group in 1995. 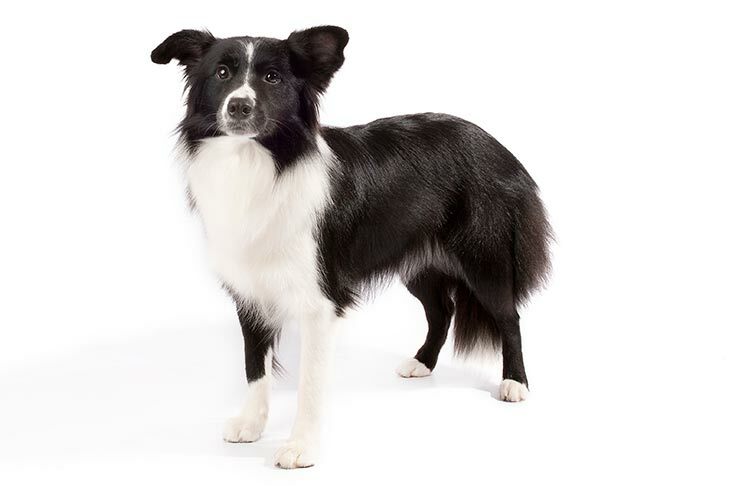 The Border Collie is AKC's 139th breed. 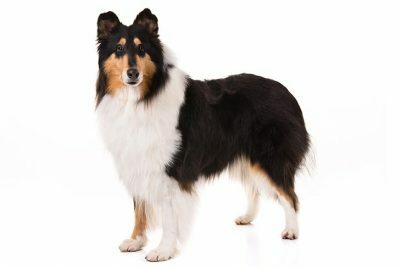 Collie is a Scottish dialect word used to describe sheepdogs, including Border Collies. 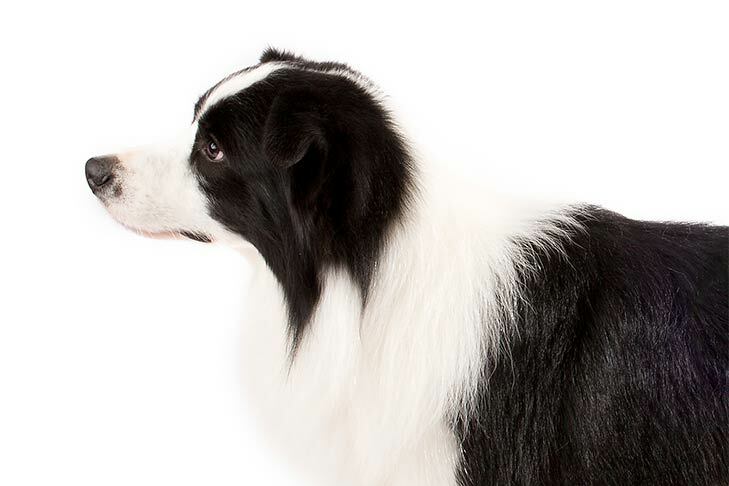 The Border Collie was first classified as the "Scotch Sheep Dog". The Border Collie was featured in the hit movie, "Babe". The 18th century poet laureate of Scotland, Robert Burns, accurately described the essence of the Border Collie, describing it as "honest" and "faithful". In the second half of the 19th century, Queen Victoria spotted a Border Collie and became an active enthusiast (at this point, the divergence between our modern Collie and the Border Collie began).